The biodiversity at Gardens by the Bay is increasing by the day! 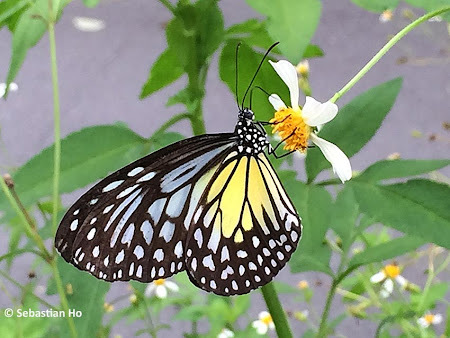 Some time in late November last year, Sebastian Ho, a staff of Gardens by the Bay, spotted a Yellow Glassy Tiger feeding on the flower of Bidens pilosa growing at the gardens. This shot was taken with Sebastian's iPhone 5s. Although this "tiger" is a common species in Malaysia, it is seldom seen in Singapore, except for the occasional migrant. Though recorded in the early checklists, this species has been seen only a handful of times in Singapore in recent years. The Yellow Glassy Tiger resembles its close cousins, the Blue and Dark Glassy Tigers. However each wing has a yellow basal patch with the yellow more extensive on the hindwing. It has been recorded mainly in urban parks and gardens like Alexandra Hospital Butterfly Trail and Hort Park. With this sighting, we add an additional species to Gardens by the Bay's butterfly checklist.